Chyn Fuh Enterprise Co., Ltd. Established in 1993. Specialize in design, develop and manufacture new products of assemble office furniture, the quota of our company grows up rapidly because of excellent quality, continue new products research and self-made delicate products. In order to comply with the rapid growing of company quota, we purchase the automatic mechanical facility, self-research precise mold for reaching the consistence operation of systemize. 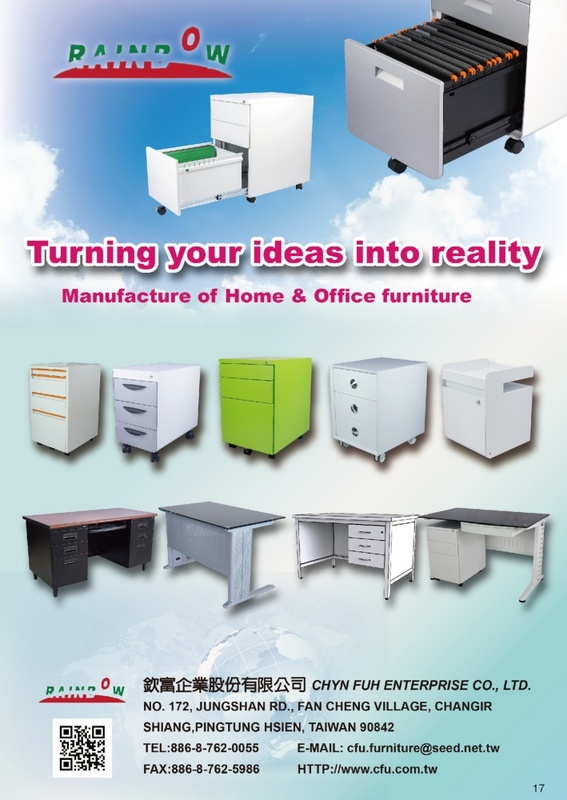 Production variously, excellent quality office products and by-products would make Rainbow as the leader in the field of office furniture in Taiwan. Producing facility: (with about 200sets of machines.) Adopt well-known outstanding equipment. Such as NC fold machine, NC shiny metal machine, continuous press machines, automatic rolling machine and so on. Leading by developing new patent products and have already got many international identity patents. Our company manufactures nice-looking, easy assembly, excellent quality, reasonable price and conform to human body technical products.